If you have already installed Yahoo! 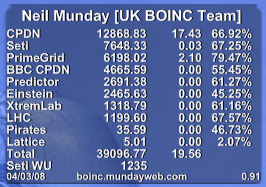 Widgets, then you can download the following BOINC widgets for your Windows or MAC desktop. As of 05/01/06, you can now get a version of the widget that shows your teams stats. Provides an update feature to alert you of new widget versions - For new versions, you can simply overwrite your previous copy with the new one. If you only want to show your user stats, you only need to dowload the user version. If you would like to show your team stats as well, then you also need to download the team version. Both widgets have the same features and have the same requirements. You must have at least version 4.0 of Yahoo! Widgets installed to use these widgets! The widgets need an Internet connection in order to operate - it does not have to be an "always-on" connection, but you must be connected to the Internet when the applet is first loaded. Note: Make sure you have to download and installed Yahoo! Widgets before proceeding. 1: If an instance of the widget is already running, close it first. (Right click -> Close widget). 2: Left click one of the download links above and choose "Save" when prompted, and save to your "My Widgets" folder. 3: To start the widget, simply double click the file in your My Widgets folder or open it via Yahoo! Widgets. 4: If upgrading, you will be warned that the widget has been modified since you last used it. Click "ok". The widget needs to know what your user ID is. Simply right click the widget and select "Widget Preferences" and enter your user ID. If you do not have a user ID, simply register for free. 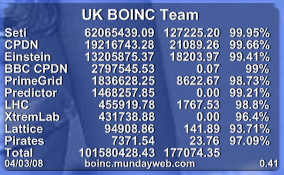 Currently the widget will contact boinc.mundayweb.com for your stats every 8 hours. Please do not modify the widget to increase the frequency of the updates as this will put an increased strain on my server and is not necessary as your stats are only updated once a day. 24/05/05 - 0.2 released. Includes colour preferences for text and text shadow. 05/06/05 - 0.3 released. Number format preference added following request from a user. Stats can now be displayed in 1,000s. 06/06/05 - 0.31 released. Changed new number format preference to comma separate stats instead. 21/08/05 - 0.4 released. Amended widget to automatically adjust its height based on the number of projects that the user has. 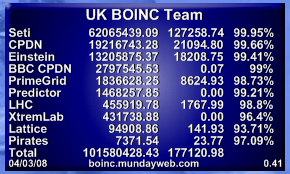 Thanks to Alan Barker (aka Red Squirrel) for the info. 23/08/05 - 0.41 released. 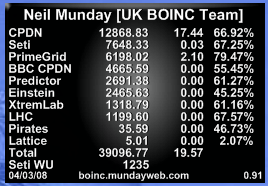 Couple of bug fixes regarding updating the colour scheme of the widget and the user ID. 24/08/05 - 0.5 released. Added background and gap preferences. Code for background preference supplied by ClarkF1. 24/08/05 - 0.51 released. Fixed lack of shadow on centered and right aligned text. This bug existed in all previous versions as far as I can tell. Thanks to ClarkF1 for pointing it out. 23/09/05 - 0.52 released. Added code to trap MySQL errors from the XML feed. This will prevent the widget from generating XML parsing errors and also prevent the widget causing Konfabulator to hang. 19/11/05 - 0.53 released. Added code to check rank format. A percentage symbol is now shown for users who have chosen to show their rank as a percentage. background colour preference (only applies to bg2.png) - Alan Barker. new background image thanks to Alan Barker. tooltip text for widget to display stats download date/time - Alan Barker. colour panel to hold colour preferences. setbg function - originally provided by ClarkF1. version alert message box now gives the user the option to go to the widget's homepage to download the new version. 25/11/05 - 0.61 released. Bug fixes for tooltip and "none" background option. 03/01/06 - 0.62 released. Added code to trap unknown errors in XML feed. 14/01/06 - 0.7 released. Improved error handling code and added support for Seti Classic user stats and amended version checking code. Also increased width and col positions to match team widget. 16/01/06 - 0.71 released. Hopefully fixed null pointer potential regarding new Seti Classic text objects. 18/01/06 - 0.72 released. Added green colour option (which went missing in previous versions) and regular expressions to replace HTML character codes for < and > in the user name. 22/01/06 - 0.73 released. Added time delay preference. 09/04/06 - 0.74	relased. Removed Seti Classic rank and average credit fields to accommodate new Seti Classic stats source. 29/09/06 - 0.75 released. Increased widget width. 06/03/07 - 0.76 released. Rank values can now be viewed comma separated. Added "top N projects" feature. 11/04/07 - 0.8 released. Ported widget to version 4.0 of Yahoo's Widget Engine. Removed dependency on the third-party xmldom.js library and replaced with XPath code. Added support for the new dock feature. Migrated from Zip format to the new flat-file format. 14/04/07 - 0.81 released. Fixed text colour bug for total line and shadow colour for title text. Added "others" pseudo project for project stats that are not shown. 05/09/07 - 0.82 released. Fixed "image not found" bug with the widget dock when no background image was chosen. 14/01/08 - 0.9 released. Fixed bug in convertNos function. Added update preference notification and added option to show only projects with RAC > 0. 04/03/08 - 0.91 released. Modified RAC prefence to only show projects with a RAC greater than a user specified value. 14/01/06 - 0.2 released. Improved error handling code and amended version checking code. 18/01/06 - 0.21 released. Added green colour option (which went missing in previous versions) and regular expressions to replace HTML character codes for < and > in the team name. 22/01/06 - 0.22 released. Added time delay preference. 29/09/06 - 0.23 released. Increased widget width. 05/12/06 - 0.24 released. Increased width of widget and adjusted column spacing. 06/03/07 - 0.25 released. Rank values can now be viewed comma separated. Added "top N projects" feature. 11/04/07 - 0.3 released. Ported widget to version 4.0 of Yahoo's Widget Engine. Removed dependency on the third-party xmldom.js library and replaced with XPath code. Added support for the new dock feature. Migrated from Zip format to the new flat-file format. 14/04/07 - 0.31 released. Fixed text colour bug for total line and shadow colour for title text. Added "others" pseudo project for project stats that are not shown. 05/09/07 - 0.32 released. Fixed "image not found" bug with the widget dock when no background image was chosen. 14/01/08 - 0.4 released. Fixed bug in convertNos function. Added update preference notification and added option to show only projects with RAC > 0. 04/03/08 - 0.41 released. Modified RAC prefence to only show projects with a RAC greater than a user specified value.